An unfinished 45.5 metre Derecktor sailing superyacht has been listed for sale on eBay with an asking price of $250,000. Previously known as Project 150, this sloop-rigged yacht was designed by legendary naval architect German Frers for the American yard and construction began in 2003. However, the project stalled when the owner pulled out. 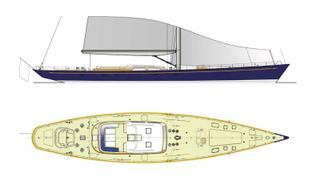 The listing explains that the aluminium hull is fully welded and watertight, and a full engineering package is included in the lot, meaning an ambitious buyer could feasibly complete the yacht at a third-party shipyard. The original interior of the Derecktor 150 was envisaged by British designer John Munford in an elegant and traditional style, reminiscent of the J Class fleet, using raised and fielded cherry woodwork and furniture. The layout allows for up to six guests split across three staterooms, including a full-beam master suite in the transom, a double and a twin cabin. Meanwhile, the crew quarters is situated underneath the foredeck, with enough room for a staff of up to eight people. The hull was designed around a single 600hp Caterpillar 3406E engine, while the total sailplan measures more than 900 square metres. Anyone looking to take advantage of this rare opportunity to turn piece of yachting history into a finished project should act quickly – the online auction for the Derecktor 150 ends on Monday (March 12).